I have a terrible, well-meaning habit of offering help without really thinking it through. I just want to be helpful! Is that so wrong? No, I guess not but sometimes, it really comes back to bite me in the tush. The PTA is having their annual 5K tomorrow, and our elementary school’s Odyssey of the Mind team is having a bake sale during the race to raise funds for their trip to the nationals in Iowa. While talking to one of the moms who manage the team, I somehow roped myself, through no fault of that mom, into offering to bake something. Not just any old thing but freaking cinnamon buns. Those of you who have made these from scratch know just how time-consuming it can be. But the date seemed so far off then, I was sure I’d have to plenty of time to gather all the ingredients and get it done. Then, Friday rolls around and it dawns on me that in addition to getting ready for our camping trip this weekend, and getting Alice to a softball game tonight, I have to make good on my offer. There was no way I had the time or energy to whip up from-scratch cinnamon buns and so I wasn’t even going to try. 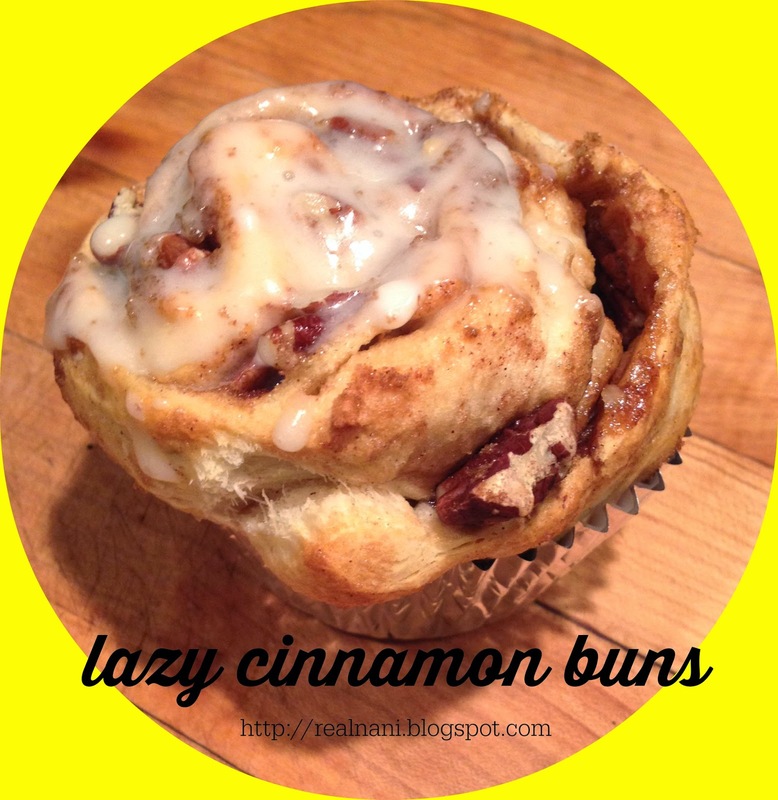 Instead, I came up with these lazy cinnamon buns! I looked at my calendar last night to see what I had on tap for the week, and I suffered a small surge of panic when I saw that I failed to take into account my daughter’s THREE half-days this week. Add in softball practice that ends at dinnertime, three meetings, a classroom birthday celebration, soccer and a playdate, and my anxiety levels were creeping upwards. Honestly, I have no idea if my kids will eat the shepard’s pie but I will and Henry will, and I have potatoes to use up. The aforementioned softball practice is on Friday, so I’ll be using a pizza crust from the store, then loading it up and popping it in the oven when we get home. Takes 12 minutes, tops! 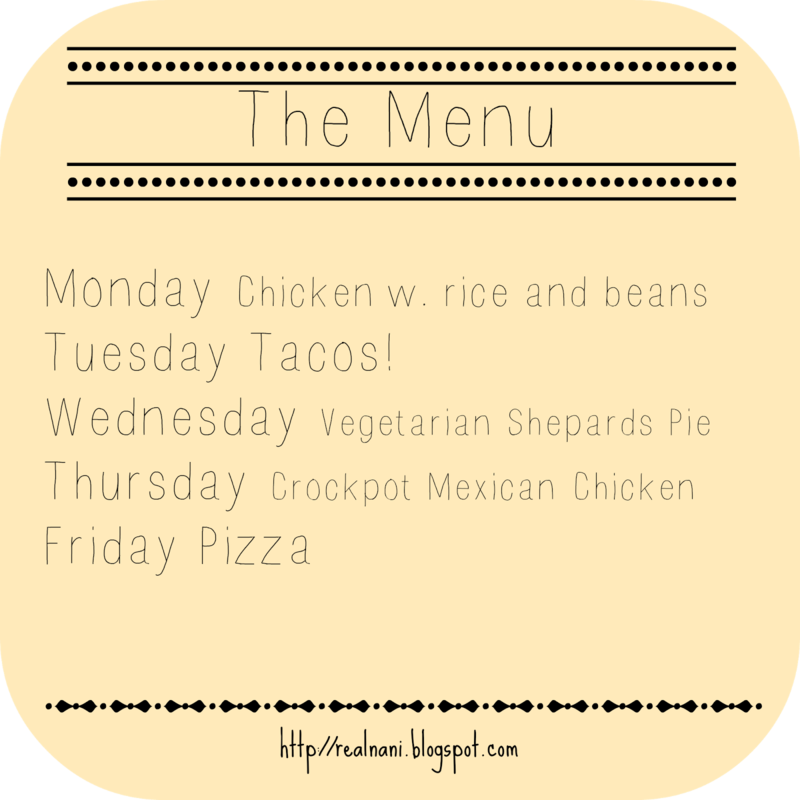 Crockpot Mexican Chicken: Chopped onions at the bottom of the crockpot, fresh or frozen boneless, skinless chicken breasts on top, cover with black beans, corn, a jar of salsa, and a little water or stock. Remove chicken from crockpot at end of cooking, shred it up and stir it back in. Serve with tortillas or tortilla chips, sour cream, shredded cheese and avocado. In other news, how happy are we that winter has been shown the door? The girls and I got out for a hike yesterday afternoon, while the boys chilled at home. Here’s us, post-hike. 2. This fish recipe is so good, and I’ve made it with halibut, mahi maui and cod. Delicious. 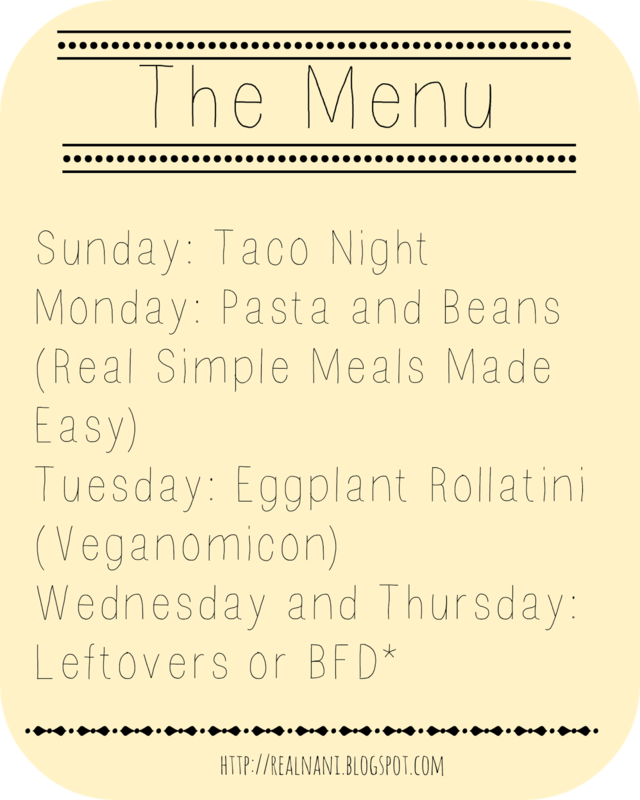 Also, confession time: Last week, I had the menu down but not so much with the planning. I didn’t buy enough cheese, and I didn’t have any steak leftover for the tacos. So, I ended up winging it towards the end of the week. But winging it is pretty easy when you have beans, rice and random vegetables. Also, one night, my kids asked for frozen peas and toast. Weirdos. We are not vegans but we do not eat a lot of meat, so I take a lot of inspiration from vegan and vegetarian cookbooks. 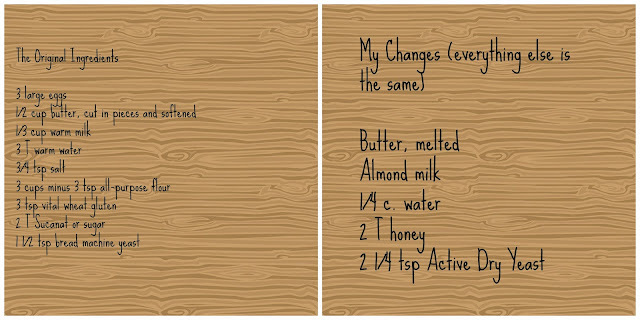 We eat dairy and eggs, so I often use the real thing even in vegan recipes. Also on my list for the week: make greek yogurt (which can be made from regular yogurt by straining it through a cheesecloth), make breadcrumbs and make hummus. Speaking of carnitas, here’s an easy way to make it. Buy a pack of boneless country-style pork ribs (or however many pounds you need to feed your brood… I buy a little more for lunch leftovers). Preheat oven to 300 degrees. Heat a little canola oil in a dutch oven or other ovenproof pot, and sear the ribs on all sides. Remove to a plate. Deglaze with a tablespoon of apple cider vinegar. Add sliced onions and carrots, along with some smashed garlic to the dutch oven. Stir until softened somewhat, then season with herbes de provence or your favorite spice mix, salt and pepper. Add the ribs back into the dutch oven, and cover with a can of peeled or crushed tomatoes. (You can even use ketchup…!) Add water to cover, and put the pot in the oven for 3-4 hours, depending on how many pounds of ribs you have. Check occasionally and add more liquid as necessary. Pork is done when it is falling apart. Remove to a plate and shred it. Put vegetables into a blender (or use immersion blender), then add back to the pot along with shredded pork. Serve warm. You can make this ahead and reheat when ready to serve. The minute the weather cools off, I go into balabusta mode. Do you know this word, balabusta? I’ve heard it before, in the little snippets of Yiddish swirling around, but didn’t know what it meant. I looked it up after reading about a cookbook from the restaurant of the same name. Yup. Except maybe I would be a passable homemaker, not always a good one! I’ve been in the kitchen a lot lately, making soups and baking bread. 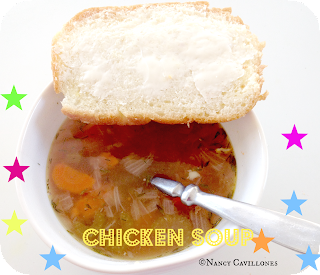 I started making my own chicken soup a few years ago, relying on my memory of various chicken soups I ate growing up, between my mom, my stepmom and my grandma. But this weekend, I think I made my best one yet. The husband and 5 year old agree that it is delicious! Place the chicken in a roasting pan or baking sheet. Season the chicken with salt and pepper, coat with oil and add a few sprigs of thyme to the roasting pan. Roast at 425 for 30-45 minutes, depending on size of chicken. The juice should run clear, and the skin should be golden and crispy. While chicken is roasting, heat oil in a soup pot, chop veggies and add to the pot, along with salt and pepper. Cook until veggies are soft, then add bay leaf and thyme sprigs. Let the chicken cool enough for handle, then remove skin and pull meat off the bones. Chop or pull the meat and set aside. Tie the bones up in a cheesecloth. Add cheesecloth-wrapped bones to the soup pot and cover with water. Bring soup to a boil, then lower to a simmer and partially cover. Simmer soup until color turns deep golden. Add more water as necessary, to keep bones covered. Remove bones from soup and discard. Add chicken and dill; continue to simmer until ready to serve. The chicken: I encourage you to buy a whole fryer, and use the parts in various ways. If I’m not roasting the whole chicken, I poach the chicken in a pot. 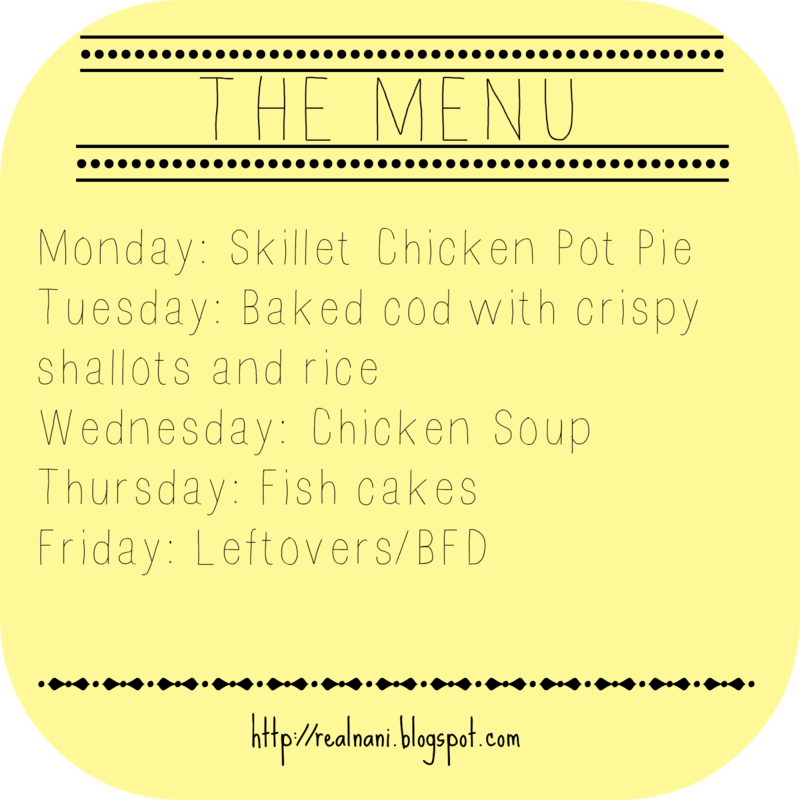 This week, I used the dark meat in chicken soup, I reserved the white meat for this pot pie, and I used the poaching liquid as the base for the chicken soup. The chicken carcass went into the freezer for future stock making. Also, if you leave the whole chicken in the pot after cooking and stick it in the fridge, you can skim the fat off the top the next day, otherwise known as schmaltz, aka your Jewish grandma’s preferred cooking fat. The crust: You can buy a pie crust at the store. In this case, I had made pate brisee earlier in the week for a pumpkin pie. 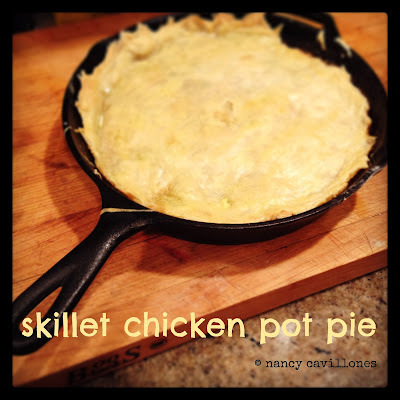 The recipe yielded two crusts, so I used the other for the pot pie. After putting the crust on the skillet, trim off the parts that hang over, roll it out again and bake yourself some crescent rolls! Just cut into triangles and roll the dough up into a crescent shape. Bake it in the oven while the pot pie is cooking. One pie crust, rolled out. In your skillet, heat up your favorite cooking fat, a tablespoon or so, over medium heat. Sweat the onions, then throw in the carrots and celery. Sauté until softened. Add some salt. Push the veggies to the sides of the pan to make room in the middle. In that space, melt the butter. 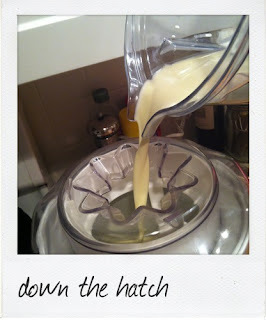 When it foams, whisk in the flour. You’ll probably end up getting some veggies into the mix– it’s fine. Stir it all up. Add the milk and chicken stock, and stir everything together. The sauce should thicken as it cooks. Add thyme and stir. Season to taste with salt and pepper. Let it cook a few minutes to meld the flavors. If there is no liquid, add more stock. You don’t want the filling to be a soup but you don’t want it to be dry either. Stir in the frozen peas. Turn off the heat. Cover the top with the pie crust and cut off any dough that is hanging over. I set my dough just inside the skillet but you can cover the rim, if you want. Baste crust with the beaten egg. Transfer hot pan to the oven and bake until crust is golden and puffy, about 30 minutes. Let the pot pie sit and cool for at least 15 minutes before eating. This is hard, I know, but it will be really hot, for one thing and another, letting it cool will allow the filling to set and become unctuous. Once upon a time, I was gifted a bread machine. And I made a lot of bread. I can’t even blame it on the kids because this was pre-kids. I’m not going to lie; I love bread and everything is better with a freshly baked loaf. My bread machine met its demise some years later. It sat on my shelf for a long time and even made an interstate move with us. I ended up giving it away to someone who was willing to make the effort to get it fixed. If I hadn’t discovered, during this period of broken bread machine-ness, how easy it is to make a loaf of bread by hand, I probably would’ve kept the machine and gotten it repaired…eventually. But luckily for me, I did make this life-changing discovery. How often do I realize that I’m out of bread and I’m too lazy to go to the store and I have nothing to make the kids’ lunches with? Too often, I’m sorry to report. While my husband and I have rustic loaves down pat, finding a good sandwich bread recipe is proving more difficult. 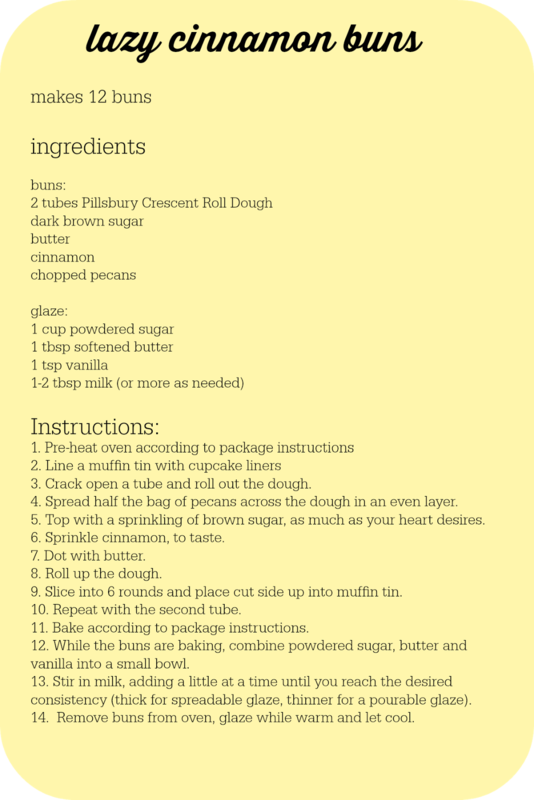 I’ve tried a few, and when my friend Justine, of Full Belly Sisters, posted her recipe for a buttery brioche bread that she’s been using in her son’s lunches, I made a mental note to try the recipe. Her recipe is for a bread machine, so what follows is my adaptation for a handmade loaf. I used almond milk because I was out of regular milk (I made my own, super easy: just blitz one cup of almonds in three cups of water in a VitaMix, then strain through a fine mesh strainer or cheesecloth). I was out of sugar, so I used honey, measure for measure. Because I was using Active Dry Yeast, I followed the instructions on the jar, which called for more yeast, and more water. I melted the butter because my house is quite cold and the butter wasn’t softening fast enough for me (I really wanted bread and now!). After the second rise. I didn’t oil my plastic wrap and look what happened!! 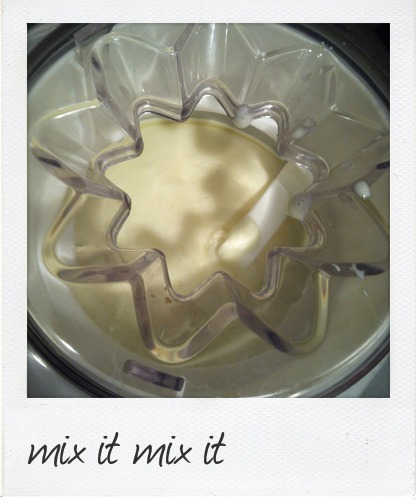 In a large bowl, dissolve yeast in warm water. Wait for it to get foamy. Add the salt, sugar, milk, and eggs. Stir with a wooden spoon. Add the flour, Vital Wheat Gluten and butter. It’ll be pretty wet and shiny. Give it a few kneads in the bowl, then cover the bowl with plastic wrap. Oil the plastic wrap. You won’t be sorry. See my photo above. Rise it in a warm spot. I used my oven, which I had just turned off, so it was still warm. You can also turn on the oven light and use the ambient warmth from that. Let it rise until it doubles, about an hour. If your ingredients were cold, the rise will take a little longer. After the first rise, punch the dough down and shape into a loaf. Place it into an oiled loaf pan and recover with the plastic wrap. Let it rise again, for another hour or until it doubles or until it almost overflows the pan (oops…). After the second rise, preheat the oven to 350 degrees and bake the loaf for 30 minutes or so, depending on your oven. The loaf came out nice and light, and very soft. Deeper kneading and a longer rise might’ve produced a sturdier custard (the texture of the inside of the loaf) but it’ll do! I made the kids grilled cheese with it tonight. Lucky for me, they fell asleep before dinner and I got to eat it. Presto Pesto, Vegan by Default. It’s been awhile since I wrote a food post, but I made a pesto sauce tonight that I want to record for posterity and share with you all, because it was delicious, if I say so myself! In a skillet, I heated up some olive oil and threw a few crushed cloves of garlic in there. When the pasta was nearing the end of boiling time, I dumped the frozen peas into a colander and stuck the whole colander in the boiling water. I took it out when the peas looked a healthy green, then rinsed them under cold water. I poured the peas into my food processor (reserving a bunch to put in the kids’ pasta), then drained the pasta. To the peas, I added the juice of one lemon, and a lot of pine nuts. I can’t say how much… the whole bag, pretty much. I pureed those up, adding the olive oil in a stream through the feeder until the consistency looked right. I left it a little chunky, just thick enough to coat the spaghetti. I didn’t add garlic to this mixture because of the garlic-infused olive oil but if you don’t make the olive oil, then definitely add a few cloves of garlic. I portioned out two bowls of plain spaghetti, added butter and the reserved peas. I gave these boring bowls to the kids. The remainder of the spaghetti, I added to the infused olive oil, stirred it around and served it up in bowls for Henry and I, with a big spoonful of the pesto on top. 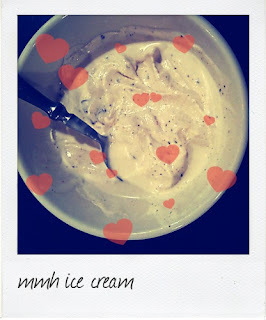 Seriously delicious. Also, no pictures because do you know how hard it is to photograph green food well? Very. I’m a latecomer to borscht. Growing up, I would see the stuff in jars in the supermarket and think, “Gross!” But the summer I turned 16, I was in Israel, and spent a weekend hosted by a family in Haifa. 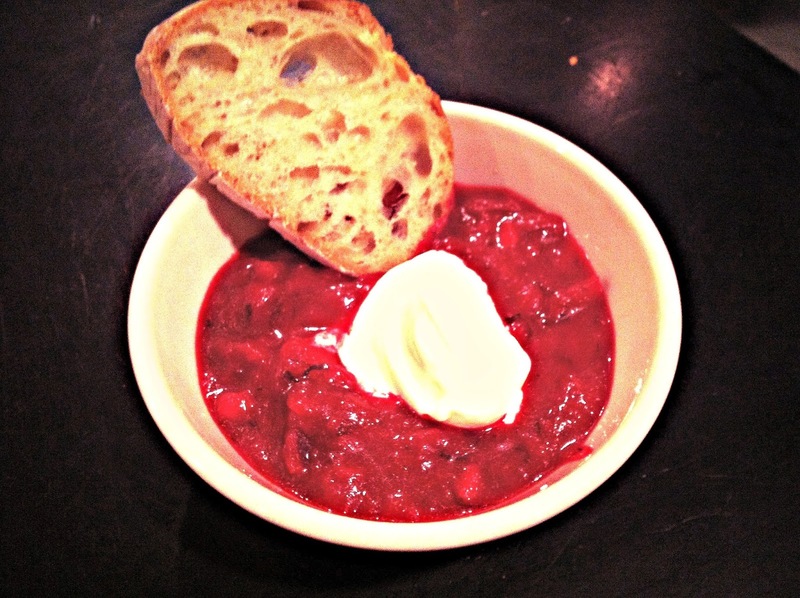 I was served cold borscht, with a generous dollop of sour cream and a few slice of white bread. I turned a corner then but didn’t have borscht again for a long time. Years later, I visited my friend Yelena and her family in Toronto. Her mother, born and raised in Russia, made a green borscht and packed it up for my train ride back to New York. This was the day of the Great Black-Out of 2003, and I was so grateful for that soup as my train sat in Utica for hours, waiting for electricity. I still think about that soup all the time. The other day, I got hit with a craving for borscht. I was searching for winter soup recipes online, and saw a picture of borscht. Since then, I haven’t stopped thinking about it. I googled around for borscht recipes and discovered that there are as many borscht recipes as there are people. Some of the recipes were incredibly time-consuming and had ingredient lists miles long, in stark contrast to the recipe found in The Book of Jewish Food, which calls for 5 ingredients. 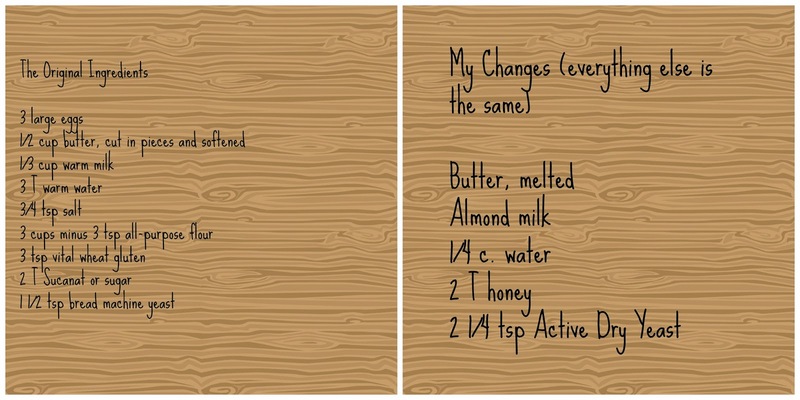 I came up with a happy medium, creating the recipe below. Delicious, if I do say so myself and judging by the shout-out I got from my husband on Facebook, it’s not just me! Pre-heat oven to 425 degrees. Trim and scrub beets, coat with olive oil and place inside a foil pouch on a baking sheet. Bake until beets are soft, about 30 minutes. Let cool to the touch, and peel skins. Chop onions into a medium dice, and add to pot once oil is ready to go. Chop carrots and potatoes to roughly the same size, medium dice. Add to pot. Stir. Chop beets to same size, and add to pot. Salt generously, add pepper to taste and stir. Cook, covered, until the potatoes have softened. Uncover, add the bag of cabbage, the beef broth and the dill. Stir to combine. 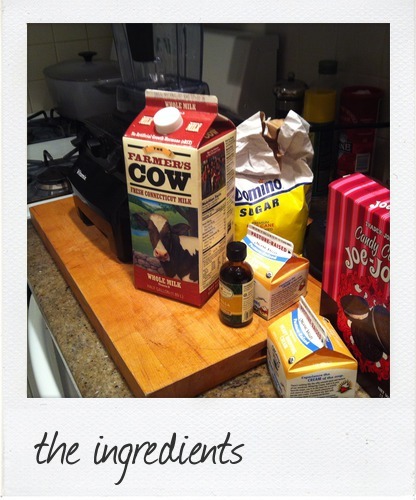 Let simmer, uncover, stirring occasionally until the ingredients have sort of melded together. Turn off heat, put about half or 3/4 of the soup into a blender and blend for a minute or less–it should still be a little chunky. Then, add it back to the pot and stir. Even though borscht is an old-world classic Russian recipe, my grandmother never made it, as far as I know. She did, however, make delicious stuffed cabbage and that is next on my list of winter cravings to satisfy. Yum. I wouldn’t know Candy Cane Joe Joe’s existed if it weren’t for my friend NJ, who writes A Cookie Before Breakfast. So, thanks a lot, NJ. Also, I must give a shout-out to Justine, whose ice cream recipe has inspired my ice cream flavor adventures and to Lydia, for the new-to-me ice cream maker! 1. 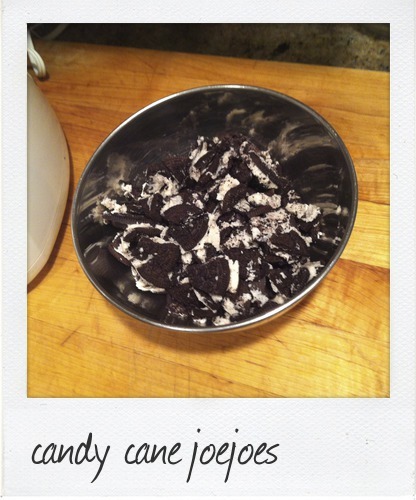 1 cup whole milk, 2 cups heavy cream, 3/4 cup sugar, pinch of salt, tsp of vanilla, candy cane joe-joes from TJ 2. dissolve the sugar and salt into the milk, mix in heavy cream and vanilla, pour into ice cream maker 3. mix for 20 minutes 4. add joe-joes during last 5 minutes of mixing. 5. pour into freezer-safe container and freeze.